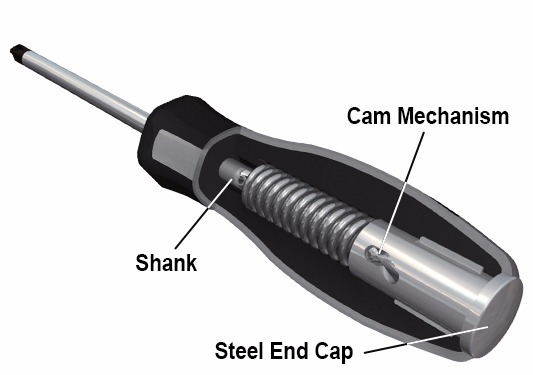 Impact screwdriver for Phillips screws with black tip, magnetised. Patented non-slip handle incorporates a cam rotation mechanism which turns the driving tip counter clockwise by 12° when hit with a hammer to loosen stuck screws, even if the screw head is stripped. Incorporates a full length thru-tang blade made of fully hardened chrome vanadium steel. Suitable for both JIS and ISO standard Phillips screws.